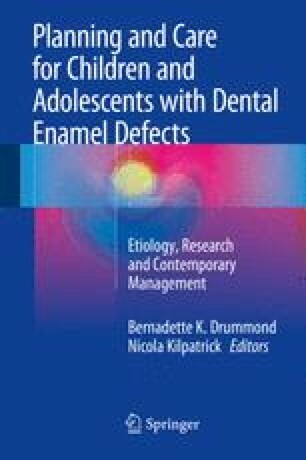 The clinical challenges associated with the restorative management of developmental defects of enamel (DDE) have been well documented and include managing sensitivity and caries risk, loss of occlusal determinants, and the negative impact on individual self-worth and social interaction. This chapter outlines management options for DDE associated with molar incisor hypomineralization (MIH), amelogenesis imperfecta (AI), fluorosis, and intrinsic discoloration in permanent teeth. Many materials and techniques may be used to manage DDE. The complexity of intervention is dictated by the severity and nature of the disturbances including color (brown/cream/yellow/white opacities – hypomineralization), structure (hypoplasia – pits, grooves), pre-eruptive resorption, post-eruptive breakdown, the patient’s individual circumstances, and the age and stage of development. Wray A, Welbury R. Treatment of intrinsic discolouration in permanent anterior teeth in children and adolescents. Available online at: www.rcseng.ac.uk. 2001; revised 2004. Accessed 2 Feb 2014.